To date, Cordlife Group Limited and its associates have released cord blood units to approximately 250 families to treat over 50 indications at over 50 institutions globally. Our proven track record is the ultimate validation of our processing and storage methods. 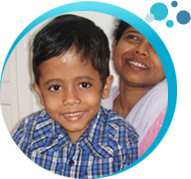 Moinam was diagnosed Thalassemia when he was barely one year old. If left untreated, most of the children inflicted with this disorder do not live beyond the age of 10. Fortuitously, his newborn sister was free from Thalassemia and her cord blood stem cells were a perfect match for Moinam, with small amount of bone marrow to supplement the transplant, Moinam is now in his recovery phase. "We decided to use a mixture of bone marrow and cord blood cells as it has a better and faster chance of success than only bone marrow cells. Bone marrow stem cells, on the other hand, could lead to Graft Versus Host Disease, triggered by the body's defense mechanism while the transfusion is being done. Not only increase the stem cell count, but also reduce the chance of any complications. It is the treatment of choice in such cases and leads to a complete cure," explained Dr Mukherjee, Medical Director of Netaji Subhash Chandra Bose Cancer Research Institute. Justin (alias) was diagnosed with a common childhood cancer, neuroblastoma, at a tender age of one and half years old. Over the course of 1 year, the child had to endure numerous rounds of high-dose chemotherapy to treat his condition. Chemotherapy destroyed cancer cells, but at the same time also killed normal cells. Fortunately, Justin’s parents had his cord blood stored at birth with Cordlife. The cord blood stem cells were infused back to his body after a course of chemotherapy in January 2011 at Queen Mary Hospital and he was discharged from hospital after 3 months. 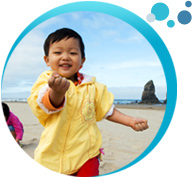 The cord blood unit used had been cryopreserved in our Hong Kong facility for 29 months. Cordlife is very proud to achieve this milestone in the cord blood banking industry in Hong Kong. Little Ray Fu was suffering from leukaemia at a tender age of three. Despite a nation-wide search for bone marrow stem cells, a suitable donor could not be found. Fortunately, baby sister of Ray Fu, Rachel Fu was born during that critical period which enabled the family to store Rachel Fu's cord blood with Cordlife, for Ray Fu's transplant. Now 10, Ray Fu is in school and his leukaemia is in remission. "We were elated when Rachel Fu's blood was shown to be a 100-per-match for Ray Fu. The healthy cell from his sister re-populated in his bone marrow and revived his immune system," said Dr Tan Ah Moy, Head and Senior Consultant for Haematology and Oncology Services at the KK Women's and Children's Hospital where the transplant was performed. An accident at birth 2.5 years ago deprived Baby Georgia of oxygen to her brain, resulting in cerebral palsy. The damage to the toddler's brain caused her to move involuntarily, suffer from muscle spasms and have up to 50 seizures a day. 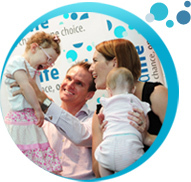 It was only after Cordlife put the family in touch with a renowned neurosurgeon that enable Georgia to be infused with her own cord blood, also stored by Cordlife. Her conditions have improved since then. "Georgia has made good progress since her stem cell infusion. She has better visual focus and eye contact with adults during play. She has more vocalization and tries to 'sing-a-song' by making different sounds to nursery rhymes. Georgia has improved postural and head control and is observed to be reaching more with her arms," said Ms. Jaclyn Tan, Consultant Occupational Therapist at OzWorks Therapy.